(Nanowerk News) When heat travels between two objects that aren't touching, it flows differently at the smallest scales—distances on the order of the diameter of DNA, or 1/50,000 of a human hair. While the thermal energy still flows from the warmer place to the colder one, the researchers found it does so 10,000 times faster than it would at the scale of, say, a bonfire and a pair of chilly hands. "Faster" here refers to the speed at which the temperature of one sample changes the temperature of the other—and not the speed at which the heat itself travels. Heat is a form of electromagnetic radiation, so it moves at the speed of light. What's different at the nanoscale is the efficiency of the process. Reddy and Edgar Meyhofer, a professor of mechanical engineering and biomedical engineering, led the work. A paper on the findings is newly published online in Nature ("Radiative heat transfer in the extreme near field"). The phenomenon the researchers studied is "radiative heat"—the electromagnetic radiation, or light, that all matter above absolute zero emits. It is the emission of the internal energy of matter from movement of particles in matter—movement that only happens above absolute zero. The facility the researchers used is an ultra-low vibration chamber in the G. G. Brown Laboratories, the university's newly renovated mechanical engineering complex. The chamber—one of several—was custom designed for performing nanoscale experiments so precise that mere footsteps could disturb them if they were done somewhere else. The rooms can withstand vibration from outside, such as traffic, and inside, such as heating and cooling systems. They also limit acoustic noise, temperature and humidity variations, as well as radio frequency and magnetic interference. For each material, they designated one sample that would be heated to 305 Fahrenheit, and they coated the tip of the probe with the same material, but kept it at a cooler 98 degrees. They slowly moved the sample and the probe together, beginning at 50 nanometers until they were touching, and they measured the temperature of the tip at regular intervals. 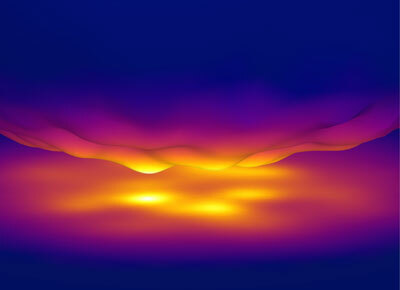 The cause of the rapid heat transfer, the researchers discovered, is that in nanoscale gaps there can be an overlap of the two sides' surface and evanescent waves, both of which carry heat.